The decision to demolish Penn Station nearly 50 years ago haunts New York City today as we grapple with the need to expand our rail transit capacity in the 21st century. The current version of Penn Station, pinned beneath Madison Square Garden, is not merely an unsightly and unwelcoming entrance to our City, it is an overburdened facility that is incapable of being expanded with Madison Square Garden at its current location. That is why I am convinced that Madison Square Garden must move. Ensuring that Penn Station could be modernized to meet future transit demands was the key issue facing my office when we recently reviewed Madison Square Garden’s request for a permit in perpetuity to continue operating in its present location. After an intensive review, I endorsed a 10-year permit and also recommended that we begin steps to relocate Madison Square Garden to a nearby site to pave the way for a badly-needed expansion of Penn Station. Fifty years ago, the station accommodated 200,000 daily passengers. Today it serves over 650,000—and the total will swell in future years. There is a growing consensus that we must launch a city, state and federal effort to implement a Moynihan-Penn Station Master Plan that will spur economic development in Midtown and clear the way for rail transit improvements in the nation’s busiest rail hub. My recommendations have been largely reaffirmed by the City Planning Commission and the City Council. No one disputes the economic contributions which Madison Square Garden makes to New York City. Its more than 400 annual events draw 3.6 million guests each year and it employs 5,800 people. The Garden’s total direct and indirect impact from employment and spending totals $527.9 million each year. But these benefits cannot overshadow the physical constraints it places on a crucial part of the city’s infrastructure. Plans to expand mass transit along the Northeast Corridor with new trans-Hudson connections and in the upgrading of high-speed rail will directly affect Penn Station. To facilitate that growth we need to expand the station’s 21 tracks and 11 platforms, which have an average width of 21 feet, to accommodate additional traffic from New Jersey, Long Island, Westchester, and the entire Eastern Seaboard. But the tracks cannot be expanded without removing the support pillars and columns of Madison Square Garden, which extend all the way down to the track level. The Garden is literally an obstacle to the realization of a 21st century Penn Station. For all these reasons, it is time to move Madison Square Garden and build a station that will further encourage rail transit use, reduce driving into the city, create thousands of jobs and spur business growth. This is hardly a new idea: Over the past decade there have been several plans to move Madison Square Garden to another Midtown site—plans in which the Garden was a willing participant. With the expansion of Penn Station more important than ever, we must find a new location for the arena. We will pave the way for transit-oriented development that will revitalize West Midtown, and improve the lives of hundreds of thousands of tri-state commuters and the millions more who visit New York City every year. Although our City may well be judged by what we’ve built and what we’ve destroyed. we will also be judged by where and how we choose to rebuild our civic monuments, whether lost to time, tragedy, or indifference. 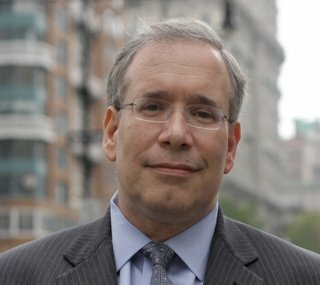 – Scott M. Stringer has served as Manhattan Borough President since 2006. He is presently a candidate for NYC Comptroller. Mr. Stringer makes very valid points, but omits several key factors. Penn Station was and MSG is private property. Refusing to renew a permit aside, how does Mr. Stringer envision obtaining the property. Even if eminent domain actions were upheld after years of litigation, where would the money come from to pay for the property. Where would the money come from to pay for a new station. Mr. Stringer would do well to worry about finding the money for the public pension disaster that is coming.